(view spoiler)Right from the beginning, this book was killing me...... Kaz was freaking out over Inej, Inej was still being held captive, there was no real resolution between Nina and Matthias, and they were in a nearly impossible situation with almost no high ground to work with. They actually started the book having to camp out on a grave-yard-island-thing that had been abandoned. Super creepy- and super awesome. The entirety of the book was amazingly atmospheric. And it developed, for the most part, really well. There were one or two spots where it seemed to jump from one thing to another, but the majority of it flowed exceedingly well. MATTIAS: oh my god.... WHERE THE HELL DID THAT COME FROM??!??!!!! Seriously!!! One minute he was totally ok, the plan was working just fine, and then he gets shot?? Of all the ways to go!...... I cried. I surprised myself by crying. It's not that I didn't have any attachment to him, just that I was more attached to other characters. I think a part of the reason why I cried was because it was so unexpected. And Nina... I couldn't help but think about Nina and how they were never going to have their happy ending together. I think I may have actually been crying more for that that I was for Matthias himself. Kaz Brekker...... Damn.....Damn. I actually love him as a person and character and a person in this story. He was great. My favorite. Hands down. PLUS- him and Inej were so incredibly cute together. He's one of those characters that you can never really know how they're going to act, but deep down they are one of the "good" guys. Kaz himself probably wouldn't agree with this, but he is. Inej made that distinction herself really well in the end. This series takes place in a great world with great characters and great writing and great scenes.... I think you get the idea. 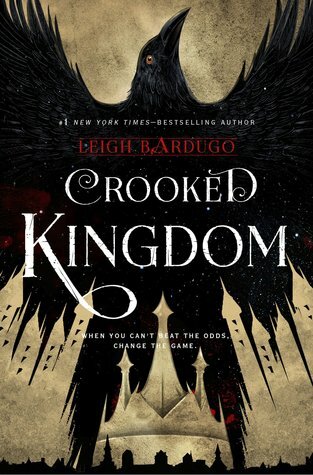 Have fun reading Crooked Kingdom!! !